Tartan Week is winding down in New York City, and I am pleased to have witnessed one of the most satisfying events – the Pipes and Fiddle Concert at Jalopy, in Brooklyn, on Thursday evening. 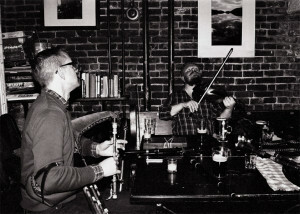 There was an opening section featuring players who frequent the weekly Monday night Scottish music session at Iona, in Williamsburg, which was blazing good fun. And then a series of very special guest artists from out of town took the stage and raised the roof on the place. The award-winning multi-instrumentalist Troy MacGillivray topped a bill that included fiddler extraordinaire Katie McNally and her pianist Neil Pearlman. And not to be out shown, Ben Miller likewise performed a thrilling set on the small pipes in duet with his musical partner, fiddler Anita MacDonald. There wasn’t an untapped foot among the audience all night long. But with such vigorous music throughout, foot stomping was more often the case. 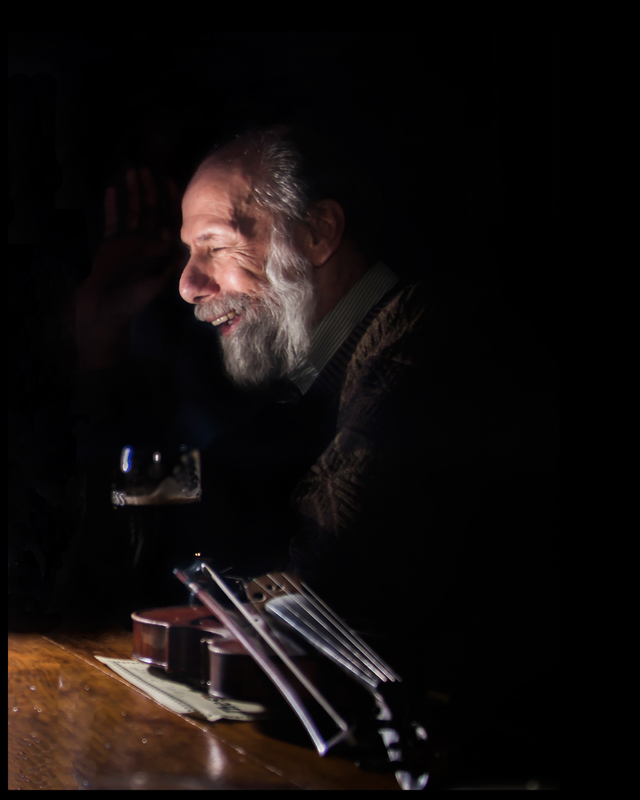 It has been at least three years since I performed at Jalopy, that quirky, delightful theater in Brooklyn, just around the corner from the Battery Tunnel entrance, in the less-traveled area between Carroll Gardens and Redhook. There one can take music lessons, buy used guitars, have dinner and a pint, and see all sorts of live performances, six nights a week. All in an intimate setting, with high ceilings, brick walls, rows of church pews, and a real stage with a top notch sound system, run by a top notch soundman. When I played there, I was appearing as a member of the Highland Shatners, and on a bill with Bargainland. 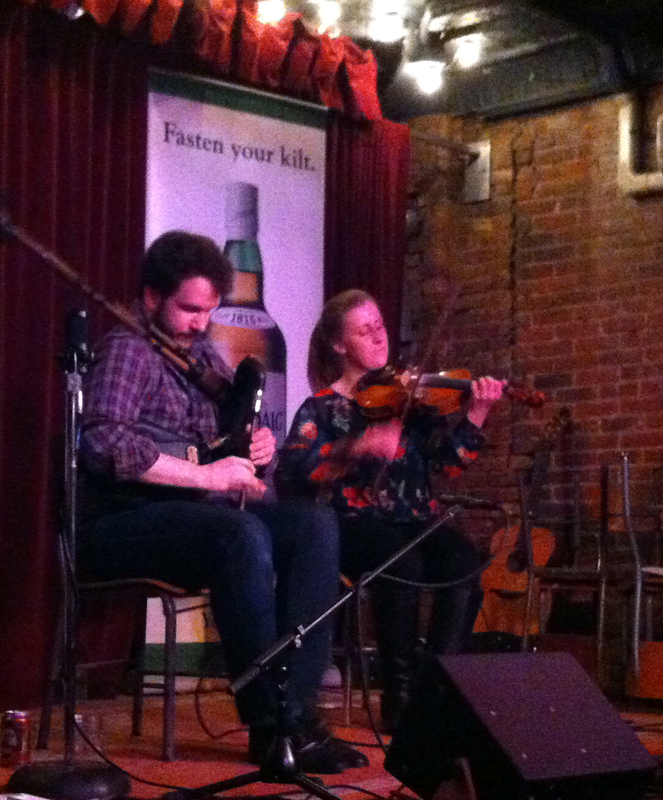 Both acts do some traditional Celtic music in a less than traditional way, as well as more contemporary fare. And there was a member of both bands taking part in the concert I saw last night. Matt Diaz, aka Flutie Shatner, was sitting in during the first section, strumming time in the Celtic DADGAD tuning on his Lowden guitar, made in Northern Ireland for just such occasions. 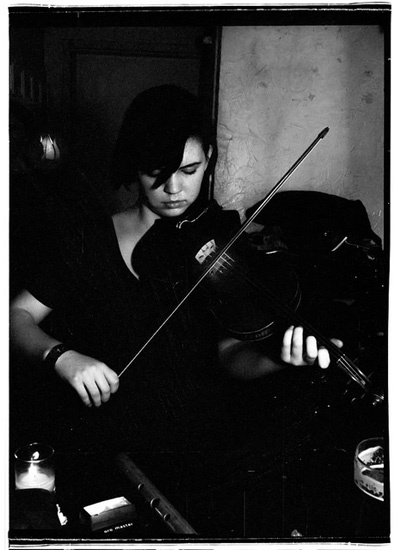 Diaz was also responsible for the exhibit of photographs lining the theater walls, featuring players from traditional music sessions, like the one at Iona. In fact, there appeared to be included at least one photo of every person on the stage, among many others. The exhibition of photos will be up for another two weeks. Karen Brown, of Bargainland, with whom I have shared many a Burn’s Night Supper and Scots music concert, was the chief organizer of the event, and took her place next to Matt to contribute some fine fiddling, along with her magnificent Scottish brogue during introductions. After a boisterous opening session by all of the Iona sessionists, there were featured a series of players in mini-sessions, often accompanied by guitarist Max Carmichael, on a well played-in Gibson J-45 (in what appeared to be Drop D tuning.) The fiddle of Calum Michael took up the banner first, followed by Amy Beshara, Andrew Forbes, and John Nevin. Each did themselves proud and the overall musicianship was truly outstanding. But if anyone stole the red ribbon from the rest, it had to be Ms. Beshara. The infectious joy that beamed from her and her fiddle strings was reflected by the audience, and set us up for all that came after. Piper Ben Miller hails from Edinburgh, Scotland, but grew up in Upstate New York. His partner, the fiddler-violist Anita MacDonald, was born and raised on Cape Breton Island, Nova Scotia. Their destinies joined when they met during a Celtic music festival and appeared to be very much in lockstep, given the fast-paced jigs and strathspey dance tunes they tossed off in absolute unison during their section of the concert. Afterwards, I discovered they were aged 25 and 22 years, respectively, and each of these excellent musicians picked up their instruments while in grammar school. Both humbly insisted they had a long way to go. As I have often recognized in fellow guitarists, there isn’t a serious player, on any level, who doesn’t feel that way in some respects or have at least one other musician they only wish they could play like. I am sure there are plenty out there who wish they could play like Miller and MacDonald. Ms. McNally and Mr. Pearlman are from Massachusetts, but the music they chose for their duets was from all over. McNally pointed out they weren’t playing “super” traditional selections, before playing a piece by “a Bangladeshi Bluegrass player from Wisconsin.” Masterful and energetic, their set filled the theater with aural radiance, as Pearlman’s rhythmic undercurrents and jazzy, spontaneous swells rose up to fill in and around McNally’s soaring melodies. And then it came time for Troy MacGillivray. More than one of the participating musicians referred to him as their “hero” and so expectations were high when he took the stage for the final section of the concert. His performance was higher still. A recipient of the queen’s Diamond Jubilee Medal for outstanding contributions to culture in Canada, the native of Lanark, Nova Scotia plays a long list of musical instruments. Tonight he performed a rousing piano duet with Neil Pearlman, and then picked up the fiddle that made him famous to calmly wow the crowd, while generously offering various members of the ensemble the opportunity to share the stage as accompanists. As satisfying as the entire concert was, it was a privilege to sit in the front row and watch the nuanced performance that unfolded at the end of the evening. I feel sorry for those who were unable to stay long enough to see MacGillivray’s final set of jigs that made me want to push all the pews to back and open up a dance floor, even if I don’t know a single step. As the midnight hour approached, the headliner asked the other two guest fiddlers to join him for an impromptu jam. So with Neil Pearlman on piano, MacGillivray, McNally, and MacDonald got down, opened up, and took off, to the delight of everyone fortunate enough to witness it, and stomp along from the audience. 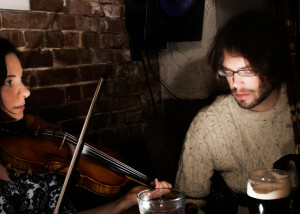 That also included Pearlman and MacDonald who each left their instrument for a time and broke into a spontaneous dance. And then the young Andrew Forbes was inspired to leap up the steps to the stage, with his border pipes strapped on, and joined in without missing a beat. Together they brought the evening to a spectacular finish. Karen Brown said afterwards that there is every expectation for a similar concert next year. But if you cannot wait that long to get your fix of fiddle sticks, DADGAD tuning, and the border pipes, do feel free to stop by Iona, on Grand Street in Williamsburg for some pints on Monday nights, as there you will find many a talented musician taking part in the weekly session. And if you are a musician yourself who would like to join in, all the better. And for those who missed the concert this year, here is a taste of the final jam session. 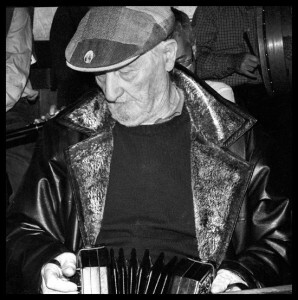 Can you perhaps tell me the name of the man pictured playing the button accordion? His name is Matty Talty. thanks for the write up, we really enjoyed the gig!